Just last week I wrote about the Marc Jacobs Stam Embossed Snakeskin Bag. The comments about the bag were sort of split, some of you loved it and some of you hated it. So, it got me thinking, was it that bag in particular that some of you didn’t like or could your dislike extend to other bags Marc Jacobs has put out there with similar features? The Marc Jacobs Cecilia Embossed Snakeskin Satchel shares many characteristics of the Stam Embossed Snakeskin Bag. However, I think if I were to choose between the two, I would choose this one. This bag is a little smaller, a little softer and I feel like it could be used more often than the other. At the same time, I definitely like the color better. In fact, it reminds me a bit of the color of the Lamarthe First Class Drawstring Bag I wrote about on Purse Blog Savvy. 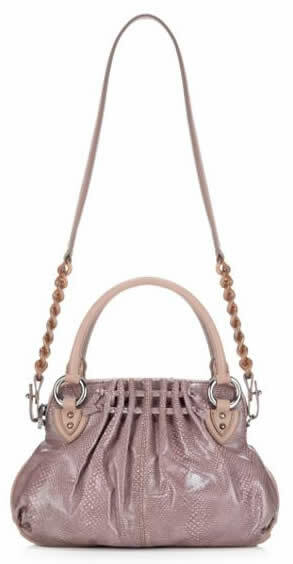 The pink snakeskin-embossed leather, silver metal hardware and rolled handles look fabulous together. The only thing I would change is the shoulder strap; I really don’t think it is needed for this size of a bag. So, what do you think, did Marc Jacobs hit or miss the mark? Buy through eLuxury for $1,250.